For the Green Day song, see Bang Bang (Green Day song). "Bang Bang" debuted at number six and later reached number three on the US Billboard Hot 100. It debuted at number one in the United Kingdom becoming Grande's second top ten single and second number one debut that year. The song also reached the top ten in fourteen countries top ten of the charts including Belgium, Bulgaria, Canada, Denmark, Finland, Ireland, Israel, Netherlands, New Zealand, Scotland, and South Korea. The single was nominated for Best Pop Duo/Group Performance at the 57th Grammy Awards (2015), and won Favorite Song of the Year at the 2015 Kids' Choice Awards. In November 2017, "Bang Bang" was certified six-times platinum by the RIAA, and has sold 3.4 million copies in the US since its release. The song was written by Savan Kotecha, Max Martin, and Carolina Liar guitarist Rickard Göransson, while the latter two co-produced it with Ilya Salmanzadeh. Minaj added her rap later. Martin had already previously collaborated with Jessie J ("Domino"), Grande ("Problem", "Break Free"), and Minaj ("Va Va Voom", "Masquerade"). Jessie J played a demo of the song, which she decided to record. Following her recording, Martin informed her that Grande wanted to record a verse. Minaj later heard the song and decided to "jump right on it". Jessie later said that "It was like a real females, coming together, empowering, supportive [vibe], and then Nicki jumping on it was like the icing on the cake." On various dates in July 2014, each of the artists uploaded a snippet of the song on her Instagram profile: Jessie J on July 9, Minaj on July 23, and Grande on July 4. A 21-second sample of "Bang Bang", featuring Jessie J singing the bridge and the chorus. "Bang Bang" is an up-tempo, "soulful" song, that features a "clap-heavy" production, built over "big bouncy beats and horn blasts." It's in the key of C mixolydian mode, with the vocals making use of the C blues scale. The tempo is 150 BPM (Allegro). The melody of the chorus has been compared to that of "Wake Me Up Before You Go-Go" by Wham!. Rob Sheffield of Rolling Stone called the song a "perfect Max Martin throwdown" that "fuses Nelly's 'Country Grammar' with Wham! 's 'Wake Me Up Before You Go-Go,' which is some truly twisted pop archaeology." Carolyn Menyes from Music Times called the song "[a] Huge successful hit of Summer 2014" and thought that "[the] song is going straight to the top of the charts". Zach Frydenlund from Complex praised Jessie J's and Ariana's heavenly vocals in the song but concentrated more on Nicki's "catchy killer verse" stating that "it's Nicki who really steals the show with her verse". Jason Lipshutz from Billboard responded positively to the song, saying that the song itself "[is] composed of piercing vocals courtesy of two contemporary crooners, as well as rapid-fire spitting from the hottest female MC on the planet, "Bang Bang" rests tidily upon the Jessie J assertion, "See anybody could be good to you/You need a bad girl to blow your mind." Vulture's Lindsey Weber thought the song was "no Lady Marmalade" but praised it saying "it's catchy enough to make a huge splash in the music history". Chris Martins from Spin stated that the song is "powerful", and credits Minaj for the song's noteworthy energy. "What makes the track so big? Well, um, ask Nicki Minaj." He goes on to further praise Minaj's performance on the song, affirming that "The "Anaconda"-taming MC rips a few mics on the loud and proud pop-soul song". Lewis Corner from Digital Spy gave the song four and a half stars out of five and said that is "one of the year's most electrifying pop anthems". In the United States, "Bang Bang" debuted atop the Billboard Digital Songs chart selling 230,000 digital downloads on the week ending August 3, 2014, becoming Grande's and Minaj's second chart topper there, and Jessie J's first. Its first week sales also marked the third-largest sales debut for a song in 2014, behind Grande's own "Problem" and Taylor Swift's "Shake It Off", both of which were co-written by Max Martin. The song launched on the US Billboard Hot 100 at number six, making it the second highest new entry of 2014 on that chart at the time, also behind Grande's "Problem". The song marked Jessie J's second, Grande's fourth, and Minaj's tenth top ten single in the United States. It also became Grande's second consecutive top ten hit of 2014, after "Problem" peaked at number two. In its second week on the Hot 100, "Bang Bang" fell to number nine selling an additional 141,000 digital downloads. The song rebounded following the release of its music video and reached a peak of number three, holding that position for 3 non-consecutive weeks, being kept off the top spot by Meghan Trainor's "All About That Bass" and Taylor Swift's "Shake It Off". Overall, "Bang Bang" spent sixteen consecutive weeks in the top ten, and a total of 31 weeks charting on the Hot 100. On Billboard's Mainstream Top 40 (Pop Songs) chart, the song debuted at number 19 and reached a peak of number two, becoming Minaj's highest charting single on that chart equaling the position her and Canadian singer Justin Bieber's 2012 single "Beauty and a Beat", and Jessie J's highest since her 2012 single "Domino" also peaked at number two there. The song became Grande's second-highest peak at the time, after "Problem" topped the chart. On the Streaming Songs chart, the song debuted at number 21 registering 3 million streams in its first week, and reached the top position on the issue dated September 13, 2014. In Canada, the single peaked at number three on the Canadian Hot 100, equaling "Problem" as Grande's highest peak in the country at the time. The song was later certified triple platinum in March 2015 for selling over 240,000 units there. In the United Kingdom, "Bang Bang" debuted at number one on the UK Singles Chart with 92,000 downloads, becoming Jessie J's third, Grande's second, and Minaj's first number one single in country. The single has since been certified double platinum by the BPI for shipments of over 1.2 million copies in the country. On the Irish Singles Chart, the track reached number three. In Australia, "Bang Bang" peaked at number four on the Australian ARIA Charts, her third consecutive top-five single there. It also peaked at number one on the Urban Singles Chart and was certified triple platinum by the Australian Recording Industry Association (ARIA) for shipments of over 210,000 copies. Internationally, the song has also peaked within the top ten of the charts in Belgium, Bulgaria, Canada, Denmark, Finland, Ireland, Israel, Netherlands, New Zealand, Scotland, and South Korea. The song's accompanying video was shot over two days in Los Angeles, California and was directed by Hannah Lux Davis. The video was officially previewed and teased in a Beats by Dr. Dre commercial that aired on August 20, 2014. Following the ad's airing, it was announced that the music video would arrive shortly after the trio's performance at the 2014 MTV Video Music Awards. On August 24, 2014 the official video was uploaded on MTV's website and was available for international viewing. On August 25, 2014, the video was released via Jessie J's Vevo account, and was Vevo-certified on November 5, having surpassed 100 million views. As of February 2019, it has accumulated more than 1.3 billion views. Jessie J, Ariana Grande, and Nicki Minaj performed the song together at the 2014 MTV Video Music Awards on August 24, 2014 in Inglewood, California alongside Grande's song Break Free and Minaj's single Anaconda, and at the 2014 American Music Awards on November 23, 2014 in Los Angeles, California. Jessie J performed the song by herself on The Ellen Degeneres Show on October 17, 2014, on The X Factor UK on 19 October, at The Concert for Valor in Washington, D.C. on November 11, 2014, and the Nickelodeon HALO Awards on November 30, 2014. She also performed "Bang Bang" with Demi Lovato on her tour in San Jose, California and with fellow coaches Delta Goodrem, Ricky Martin and The Madden Brothers on The Voice Australia in 2015. Grande performed the song by herself at the 2014 Victoria's Secret Fashion Show in London, UK on December 9, 2014 and during her international tour, The Honeymoon Tour. She also performed the song with Minaj at the NBA All-Star Game halftime show on February 15, 2015, as well as at the iHeartRadio Music Festival. Since the start of the Dangerous Woman Tour, Grande has also performed the song herself throughout her international tour that started in early February. Freeform teen drama show Pretty Little Liars featured this song in the episode "Pretty Isn't the Point". It uses the Jessie J's version choreograph and performed by the characters Hanna Marin (Ashley Benson) and Emily Fields (Shay Mitchell). The 2015 musical comedy Pitch Perfect 2 also featured this song as its soundtrack, as heard in the opening sequence (during the news reports about the Bellas' misconducts). This song also made it to the movie's special edition soundtrack album. The song has been featured in the short-lived CBS TV drama series Stalker, an episode of British sitcom Drifters and in the video game Just Dance 2015. The song became a recurring joke on the podcast Comedy Bang! Bang! when House of Lies actor Ben Schwartz began singing the song with altered lyrics to be about the show itself. The song was performed in the seventh episode of the South Korean music reality program Produce 101; the performance became a trending topic on social media with Jessie J sharing its video on her Facebook page. Jessie J's response later made the program's executive producer Han Dong-chul proud in an interview on March 10, 2016, saying: "It’s such an honor that the original singer of the song has mentioned our show. And I’m also proud that our contestants performed it so well." On May, 2016 Jessie J opened 3rd Indonesian Choice Awards with this song. The song is also used for the commercial of Nestea in the Philippines in early 2018. In October 2018 the song was used by Cadillac in an advertisement for its 2019 XT4 vehicle. A lyric in the song uses the company's name. Credits adapted from My Everything deluxe edition liner notes. Kuk Harrell – vocal production, vocal engineering for Suga Wuga Music, Inc.
^ Lipshutz, Jason (July 1, 2014). "Ariana Grande, Nicki Minaj, Jessie J: Whose New Album Are You Most Excited For?". Billboard. Retrieved December 11, 2014. ^ "Spin - 'Bang Bang'". Spin. 13 February 2015. ^ Frank, Alex. "Newly Single Nicki Minaj on Feminism, Meek Mill, and Rapping at 50". Vogue.com. Condé Nast. Retrieved 8 April 2015. ^ Crow, Jones (28 April 2015). "Five Hits, One Album: The Strategy Behind Ariana Grande's Singles From 'My Everything'". Billboard. Retrieved 29 April 2015. ^ 29th July 2014, 11:38. ""I'm So Excited!" Jessie J Talks New Song 'Bang Bang' Fresh From First Play". Capital FM. Retrieved 2014-07-31. ^ "Nicki Minaj, Ariana Grande, Jessie J Share 'Bang Bang' Clip", MTV, Retrieved on 9 July 2014. ^ Davidson, Amy "Ariana Grande, Nicki Minaj, Jessie J tease new song 'Bang Bang'", Digital Spy, Retrieved on 9 July 2014. ^ "Nicki Minaj Teases Ariana Grande & Jessie J Superstar Collaboration 'Bang Bang': Listen", Radio.com, Retrieved on 23 July 2014. ^ "Ariana Grande Shares "Bang Bang" Teaser FanLaLa Retrieved on July 28th 2014. ^ "Jessie J, Ariana Grande & Nicki Minaj Finally Unveil 'Bang Bang' | MTV UK". Mtv.co.uk. 2014-04-29. Retrieved July 31, 2014. ^ "Jessie J, Ariana Grande and Nicki Minaj's "Bang Bang": Listen To The Collaboration | Music News, Reviews, and Gossip on". Idolator.com. Retrieved 2014-07-31. ^ a b Menyes, Carolyn 07-28-2014. "Review: Jessie J, Ariana Grande Nicki Minaj 'Bang Bang' Music Times, Retrieved on July 29th 2014. ^ Sheffield, Rob (August 26, 2014). "My Everything". Retrieved April 10, 2016. ^ Frydenlund, Zach. "Listen to Jessie J's "Bang Bang" f/ Ariana Grande and Nicki Minaj" Complex, Retrieved on July 29, 2014. ^ Lipshutz, Jason. "Jessie J, Ariana Grande & Nicki Minaj Combine on 'Bang Bang': Listen" Billboard, Retrieved on July 29, 2014. ^ Weber, Lindsey. "Hear That Ariana Grande, Jessie J, and Nicki Minaj Song, ‘Bang Bang’" Vulture, Retrieved on July 29, 2014. ^ Martins, Chris (July 28, 2014). "Jessie J, Ariana Grande, and Nicki Minaj Go 'Bang Bang,' Officially". SPIN. Retrieved July 29, 2014. ^ Corner, Lewis (September 18, 2014). "Jessie J, Ariana Grande, Nicki Minaj 'Bang Bang' single review: 'Electrifying'". Retrieved January 10, 2015. ^ Greenburg, Zack O'Malley. "Grammy Nominees 2015: The Full List". Forbes. Retrieved 2018-12-07. ^ "Taylor Swift, Madonna, Justin Timberlake Own the 2015 iHeartRadio Awards". Billboard. Retrieved 2018-12-07. ^ "2015 MTV Video Music Awards Nominees Revealed: Taylor Swift, Kendrick Lamar, Ed Sheeran & More". Billboard. Retrieved 2018-12-07. ^ "Winners Gallery 2015". Retrieved December 7, 2018. ^ "People's Choice Awards 2015: The fan favorites are in". FOX31 Denver. 2015-01-08. Retrieved 2018-12-07. ^ Staff, Variety; Staff, Variety (2015-08-17). "Teen Choice Awards 2015 Winners: Full List". Variety. Retrieved 2018-12-07. ^ "Tom Petty Scores First No. 1 Album On Billboard 200". Billboard. Retrieved August 6, 2014. ^ "MAGIC! Maintains No. 1 Perch on Hot 100; 'Bang Bang,' Meghan Trainor Soar Into Top 10". Billboard. Retrieved August 6, 2014. ^ "Ariana Grande Charting History". Billboard. Retrieved September 13, 2014. ^ "First Look: Nicki Minaj, Ariana Grande, & Jessie J Shoot 'Bang Bang' Video". Rap-Up.com. 2014-07-31. Retrieved 2014-08-05. ^ "Nicki Minaj, Jessie J and Ariana Grande In New 'Beats by Dre' Commercial". Vibe (08-20-2014), Retrieved on August 29, 2014. ^ Ehhrlich, Brenna. "Jessie J, Ariana And Nicki's 'Bang Bang' Video Makes Us Wish That Summer Would Never Ever End". MTV (08-24-2014), Retrieved on August 29, 2014. ^ Videoclipe de "Bang Bang" ultrapassa a marca de 100 milhões de visualizações e recebe "Certificado Vevo" [Video for "Bang Bang" surpasses 100 million views and becomes "Vevo Certified" making Jessie J, Grande, and Minaj Certivied] (in Portuguese). Retrieved November 14, 2015. ^ "Ariana Grande Will Perform at 2014 American Music Awards". Billboard. Retrieved 8 December 2014. ^ Jason Lipshutz (15 February 2015). "Ariana Grande Brings Out Nicki Minaj During NBA All-Star Halftime Show". Retrieved 17 February 2015. ^ LaToya Ferguson (30 October 2014). "'Stalker' upchucks an episode that would make even 'The Cape' proud - Zap2it - News & Features". Zap2it. Retrieved 8 December 2014. ^ "Bang! Bang! Into Your Mouth!, episode #327 of Comedy Bang Bang: The Podcast". Earwolf. 5 January 2015. Retrieved 22 February 2016. ^ "Jessie J shares 'Produce 101' cover of 'Bang Bang'". Netizen Buzz. March 10, 2016. Retrieved March 12, 2016. ^ "Jessie J Mentions "Produce 101" on Her Facebook, PD Responds". Soompi. March 10, 2016. Retrieved April 3, 2016. ^ "2019 Cadillac XT4 Commercial Song – Woman Driving Red Cadillac". CommercialSong.net. October 15, 2018. Retrieved November 16, 2018. ^ a b "Bang Bang (2-Track) Single: Amazon.de: Musik" (in German). Amazon.com, Inc. Retrieved September 5, 2014. ^ a b "iTunes - Music - Bang Bang - Single by Jessie J, Ariana Grande & Nicki Minaj". iTunes Store (US). Apple, Inc. Retrieved 2014-07-31. ^ "iTunes - Music - Bang Bang (Remixes) - EP by Jessie J, Ariana Grande & Nicki Minaj". iTunes Store (NZ). Apple Inc. Retrieved September 25, 2014. ^ "Bang Bang by Jessie J on Spotify". Spotify. ^ "Australian-charts.com – Jessie J / Ariana Grande / Nicki Minaj – Bang Bang". ARIA Top 50 Singles. Retrieved August 2, 2014. ^ "ARIA Urban Singles Chart - 22/9/14". ARIA Charts. September 21, 2014. Archived from the original on September 23, 2014. ^ "Austriancharts.at – Jessie J / Ariana Grande / Nicki Minaj – Bang Bang" (in German). Ö3 Austria Top 40. Retrieved January 9, 2016. ^ "Ultratop.be – Jessie J / Ariana Grande / Nicki Minaj – Bang Bang" (in Dutch). Ultratop 50. Retrieved September 20, 2014. ^ "Ultratop.be – Jessie J / Ariana Grande / Nicki Minaj – Bang Bang" (in Dutch). Ultratop Urban. Retrieved September 12, 2014. ^ "Ultratop.be – Jessie J / Ariana Grande / Nicki Minaj – Bang Bang" (in French). Ultratop 50. Retrieved October 25, 2014. ^ "Ultratop.be – Jessie J / Ariana Grande / Nicki Minaj – Bang Bang" (in French). Ultratip. Retrieved October 25, 2014. ^ "Jessie J Chart History (Canadian Hot 100)". Billboard. Retrieved September 11, 2014. ^ "Chart Search". Billboard Canada AC for Jessie J. Retrieved January 9, 2016. ^ "Jessie J Chart History (Canada CHR/Top 40)". Billboard. Retrieved October 9, 2014. ^ "Jessie J Chart History (Canada Hot AC)". Billboard. Retrieved October 23, 2014. ^ "ČNS IFPI" (in Czech). Hitparáda – Radio Top 100 Oficiální. IFPI Czech Republic. Note: Change the chart to CZ – RADIO – TOP 100 and insert 201446 into search. Retrieved November 17, 2014. ^ "ČNS IFPI" (in Czech). Hitparáda – Digital Top 100 Oficiální. IFPI Czech Republic. Note: Change the chart to CZ – SINGLES DIGITAL – TOP 100 and insert 201436 into search. Retrieved September 8, 2014. ^ "Danishcharts.com – Jessie J / Ariana Grande / Nicki Minaj – Bang Bang". Tracklisten. Retrieved August 8, 2014. ^ "Jessie J – Chart history" Billboard Euro Digital Songs for Jessie J. Retrieved October 2, 2014. ^ "Nicki Minaj,Jessie J,Ariana Grande: Bang Bang" (in Finnish). Musiikkituottajat – IFPI Finland. Retrieved September 15, 2014. ^ "Lescharts.com – Jessie J / Ariana Grande / Nicki Minaj – Bang Bang" (in French). Les classement single. Retrieved August 8, 2014. ^ "Offiziellecharts.de – Jessie J / Ariana Grande / Nicki Minaj – Bang Bang". GfK Entertainment Charts. Retrieved September 1, 2014. ^ "Jessie J Album & Chart History". Billboard Greece Digital Songs for Jessie J. Retrieved September 25, 2014. ^ "Archívum – Slágerlisták – MAHASZ" (in Hungarian). Single (track) Top 40 lista. Magyar Hanglemezkiadók Szövetsége. Retrieved September 4, 2014. ^ "Chart Track: Week 39, 2014". Irish Singles Chart. Retrieved September 26, 2014. ^ "Jessie J / Ariana Grande / Nicki Minaj – Bang Bang Media Forest". Israeli Airplay Chart. Media Forest. Retrieved August 22, 2014. ^ "Jessie J feat. Ariana Grande & Nicki Minaj on the FIMI charts" (in Italian). Federazione Industria Musicale Italiana. Retrieved April 8, 2018. ^ "Chart Search". Billboard Japan Hot 100 for Jessie J. Retrieved January 9, 2016. ^ "Nederlandse Top 40 – Jessie J Ariana Grande Nicki Minaj" (in Dutch). Dutch Top 40. Retrieved September 5, 2014. ^ "Dutchcharts.nl – Jessie J / Ariana Grande / Nicki Minaj – Bang Bang" (in Dutch). Single Top 100. Retrieved September 12, 2014. ^ "Charts.nz – Jessie J / Ariana Grande / Nicki Minaj – Bang Bang". Top 40 Singles. Retrieved July 31, 2014. 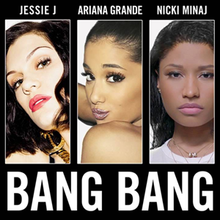 ^ "Norwegiancharts.com – Jessie J / Ariana Grande / Nicki Minaj – Bang Bang". VG-lista. Retrieved September 5, 2014. ^ "Official Scottish Singles Sales Chart Top 100". Official Charts Company. Retrieved September 28, 2014. ^ "ČNS IFPI" (in Slovak). Hitparáda – Radio Top 100 Oficiálna. IFPI Czech Republic. Note: insert 201447 into search. Retrieved November 24, 2014. ^ "ČNS IFPI" (in Slovak). Hitparáda – Singles Digital Top 100 Oficiálna. IFPI Czech Republic. Note: Select SINGLES DIGITAL - TOP 100 and insert 201438 into search. Retrieved September 22, 2014. ^ "2016년 11주차 Digital Chart" (in Korean). GAON. Retrieved March 19, 2016. ^ "2016년 11주차 Digital Chart (International)" (in Korean). GAON. Retrieved March 19, 2016. ^ "Spanishcharts.com – Jessie J / Ariana Grande / Nicki Minaj – Bang Bang" Canciones Top 50. Retrieved August 9, 2014. ^ "Swedishcharts.com – Jessie J / Ariana Grande / Nicki Minaj – Bang Bang". Singles Top 100. Retrieved September 11, 2014. ^ "Swisscharts.com – Jessie J / Ariana Grande / Nicki Minaj – Bang Bang". Swiss Singles Chart. Retrieved November 10, 2014. ^ "Official Singles Chart Top 100". Official Charts Company. Retrieved September 28, 2014. ^ "Jessie J Chart History (Hot 100)". Billboard. Retrieved September 25, 2014. ^ "Jessie J Chart History (Adult Contemporary)". Billboard. Retrieved November 27, 2014. ^ "Jessie J Chart History (Adult Pop Songs)". Billboard. Retrieved October 30, 2014. ^ "Jessie J Chart History (Dance Club Songs)". Billboard. Retrieved October 16, 2014. ^ "Ariana Grande Chart History (Dance Mix/Show Airplay)". Billboard. Retrieved November 8, 2014. ^ "Jessie J Chart History (Pop Songs)". Billboard. Retrieved November 6, 2014. ^ "Jessie J Chart History (Rhythmic)". Billboard. Retrieved October 9, 2014. ^ "Top 100 - Record Report". Record Report. R.R. Digital C.A. October 25, 2014. Archived from the original on October 28, 2014. ^ "End of Year Charts – ARIA Top 100 Singles 2014". ARIA Charts. Australian Recording Industry Association. Archived from the original on January 9, 2015. Retrieved February 4, 2015. ^ "JAAROVERZICHTEN 2014: Urban" (in Dutch). Ultratop. Hung Medien. Retrieved December 26, 2014. ^ "2014 Year End Charts - Top Canadian Hot 100". Billboard. Retrieved December 11, 2014. ^ "FIMI - Classifiche Annuali 2014 "TOP OF THE MUSIC" FIMI-GfK: un anno di musica italiana" (in Italian). Federazione Industria Musicale Italiana. Retrieved 14 January 2015. ^ "JAAROVERZICHTEN - SINGLE 2014" (in Dutch). dutchcharts.nl. Archived from the original on January 12, 2015. Retrieved December 26, 2014. ^ "Top Selling Singles of 2014". nztop40.co.nz. Retrieved December 26, 2014. ^ "2014년 Digital Chart (International)" (in Korean). GAON. Retrieved September 14, 2017. ^ "Hot 100 Songs – Year End 2014". Billboard.com. Retrieved December 11, 2014. ^ "2014 Year End Charts - Adult Pop Songs". Billboard. Retrieved December 9, 2014. ^ "2014 Year End Charts - Pop Songs". Billboard. Retrieved December 9, 2014. ^ "JAAROVERZICHTEN 2015: Urban" (in Dutch). Ultratop. Hung Medien. Archived from the original on February 4, 2016. Retrieved January 9, 2016. ^ "Canadian Hot 100 Year End 2015". Billboard. Prometheus Global Media. Retrieved 9 December 2015. ^ "FIMI – CLASSIFICHE "TOP OF THE MUSIC" 2015 FIMI-GfK: LA MUSICA ITALIANA" (in Italian). Federazione Industria Musicale Italiana. Retrieved January 9, 2016. ^ "JAAROVERZICHTEN - SINGLE 2015" (in Dutch). dutchcharts.nl. Retrieved January 9, 2016. ^ "2015년 Digital Chart (International)" (in Korean). GAON. Retrieved September 14, 2017. ^ "Hot 100: Year End 2015". Billboard. billboard.com. Retrieved 9 December 2015. ^ "2016년 Digital Chart (International)" (in Korean). GAON. Retrieved September 14, 2017. ^ "2018년 Digital Chart (International)" (in Korean). GAON. Retrieved May 4, 2018. ^ "ARIA Charts – Accreditations – 2015 Singles". Australian Recording Industry Association. Retrieved August 25, 2014. ^ "Canadian single certifications – Jessie J, Ariana Grande and Nicki Minaj – Bang Bang". Music Canada. Retrieved March 2, 2015. ^ "Gold-/Platin-Datenbank (Jessie J feat. Ariana Grande & Nicki Minaj; 'Bang Bang')" (in German). Bundesverband Musikindustrie. Retrieved April 18, 2018. ^ "Italian single certifications – Jessie J, Ariana Grande & Nicki Minaj – Bang Bang" (in Italian). Federazione Industria Musicale Italiana. Retrieved January 9, 2015. Select "2014" in the "Anno" drop-down menu. Select "Bang Bang" in the "Filtra" field. Select "Singoli online" under "Sezione". ^ "New Zealand single certifications – Jessie J, Ariana Grande and Nicki Minaj – Bang Bang". Recorded Music NZ. Retrieved May 2, 2016. ^ "Norwegian single certifications – Ariana Grande, Nicki Minaj, Jessie J – Bang Bang" (in Norwegian). IFPI Norway. Retrieved February 26, 2017. "2014년 총결산 International Download Chart" (in Korean). Gaon Singles Chart. Archived from the original on February 14, 2015. "2015년 총결산 International Download Chart" (in Korean). Gaon Singles Chart. Archived from the original on January 17, 2016. "2016년 총결산 International Download Chart" (in Korean). Gaon Singles Chart. Archived from the original on February 26, 2017. ^ "Jessie J, Ariana Grande and Nicki Minaj - Bang Bang" (in Swedish). Grammofon Leverantörernas Förening. Retrieved January 14, 2015. ^ "British single certifications – Jessie J, Ariana Grande and Nicki Minaj – Bang Bang". British Phonographic Industry. Retrieved June 1, 2018. Select singles in the Format field. Select Platinum in the Certification field. Type Bang Bang in the "Search BPI Awards" field and then press Enter. ^ "American single certifications – Jessie J, Ariana Grande and Nicki Minaj – Bang Bang". Recording Industry Association of America. Retrieved December 17, 2014. If necessary, click Advanced, then click Format, then select Single, then click SEARCH. ^ "Certificeringer - Jessie J, Ariana Grande, and Nicki Minaj - Bang Bang". IFPI Denmark. Retrieved November 13, 2014. ^ "Top 100 Streaming - Semana 44: del 27.10.2014 al 02.11.2014" (PDF) (in Spanish). PROMUSICAE. Retrieved November 7, 2014. ^ "RIAA Adds Digital Streams To Historic Gold & Platinum Awards". Recording Industry Association of America. May 9, 2013. Archived from the original on October 19, 2014. Retrieved May 9, 2013. ^ "Hot/Modern/AC Future Releases". All Access. All Access Music Group. Archived from the original on July 26, 2014. Retrieved April 30, 2017. ^ "Top 40/M Future Releases". All Access. All Access Music Group. Archived from the original on July 30, 2014. Retrieved April 30, 2017. ^ "Top 40/R Future Releases". All Access. All Access Music Group. Archived from the original on July 29, 2014. Retrieved April 30, 2017. ^ "Bang Bang: Ariana Grade and Jessie J and Nicki Minaj". Amazon.com (DE). Retrieved August 19, 2014. ^ "Jessie J, Ariana Grande & Nicki Minaj "Bang Bang"". Radio Airplay s.r.l. Retrieved April 30, 2017. ^ "iTunes - Music - Bang Bang - Single by Jessie J, Ariana Grande & Nicki Minaj". iTunes Store (IE). Apple, Inc. Retrieved August 7, 2014. ^ "Listen to Jessie J, Ariana Grande and Nicki Minaj's Bang Bang". Officialcharts.com. Retrieved July 31, 2014.